Oh, how gorgeous, friend! <3 Thank you for sharing!! Yinepuemsaes - "Yinepu is her protection"
My big ol shrine + tarot shelf! Excuse my teamaker box, I didn't feel up to moving it. New dishes and libation cups are incoming! Any commentary would be welcome. I like all the photos and notes, Capra! Mine is pretty minimalist, something I'd like to work on. I've got both birth and adopted family so this is a veeeeery pared down version. The tin holds other pics and obits I couldn't include on the wall. 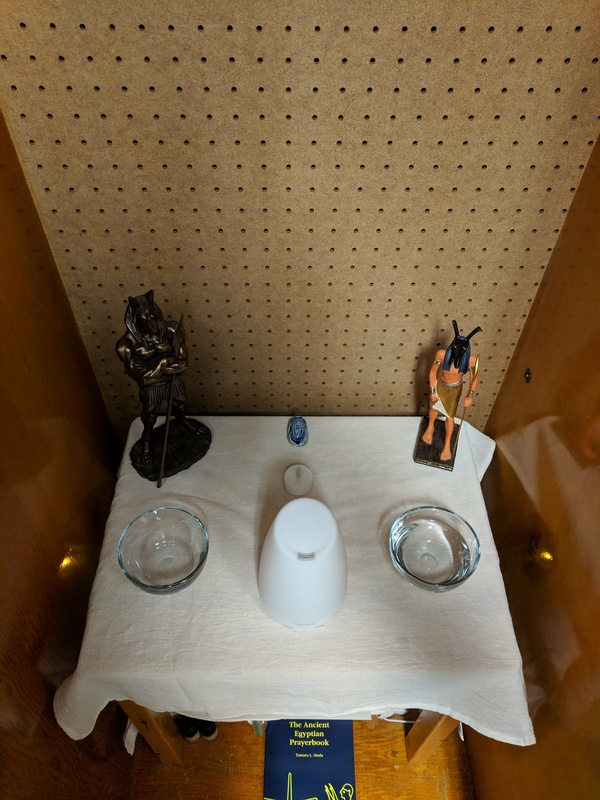 My shrine at the moment is very minimalistic because I'm living in a dorm so I can't make it as pretty as I want it to, but here's what I got! 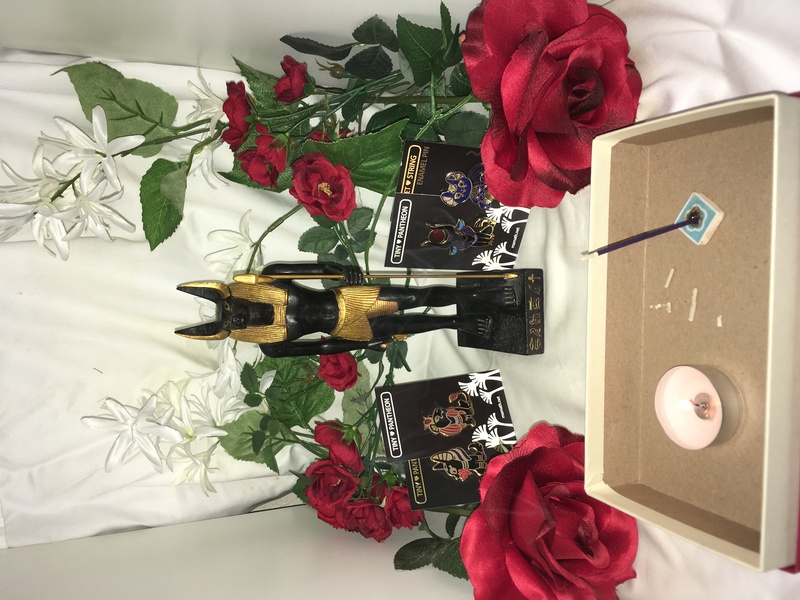 A statue of Sobek, some prayer beads for Sutekh, and a bunch of other things that I've given to Sobek. A young Kemetic who is still learning about himself and his connection with the Netjer. I'm strictly Kemetic. So the NEW shrine, with Dad, plus pins of Him and each of my Beloveds! I didn't do the Kickstarter for those pins (because I would have wanted all of them and could not afford it) but now I am enamored of them. Ubenet gave me a Sekhmet one last summer for my birthday and She lives on my purse along with a Nekhbet. I had done the kickstarter and got the two-pin tier - I'd asked for Yinepu and Wepwawet (wayyyyy before RPD btw) so I already had Dad! My Beloveds I bought after RPD, as a cute little way to keep Them with me ♥ And as a placeholder til I get proper statues. You can actually buy the pins now (when they're available) on the artist's etsy! Bit on the minimalist side given budgetary and university limitations on items allowed in the dorm. I highly recommend using an oil diffuser for anyone who finds incense to be bothersome for allergies/asthma/etc. "My Two Fathers are Confident"
Em hotep Djed of Wesir! I like the simple clean look. 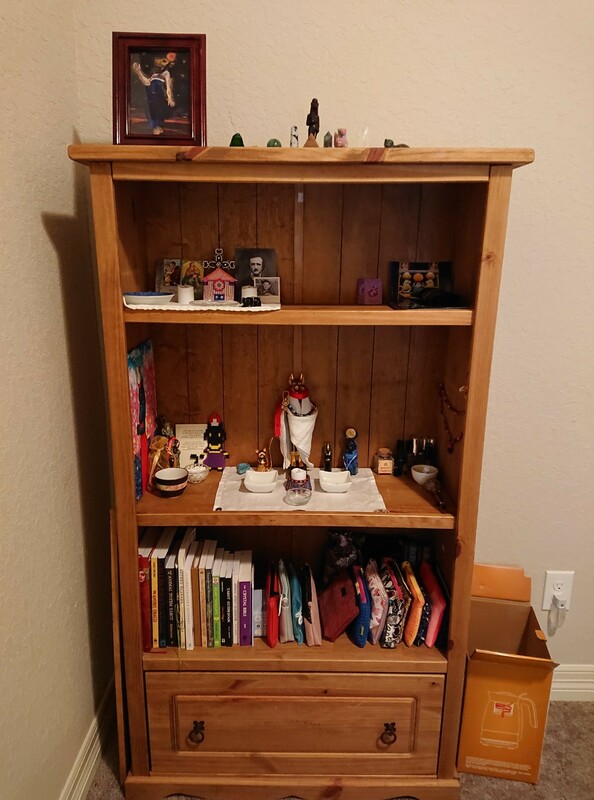 Your shrine looks good. Even small rivers keep the lands green and the oceans wet. How Much Time Does an RPD Take? How Much Time Does It Take....?